If using crescent rolls: Unroll dough and separate into 4 rectangles; firmly press perforations to seal. If using dough sheet: Unroll dough; cut into 4 rectangles. Cut each into 6 squares. Gently press squares into mini muffin cups (dough will not completely cover inside of cup; do not press too much). Spoon 1/2 teaspoon preserves into each cup. Top with rounded 1/2 teaspoon nuts and 1 cheese chunk. Bake 16 to 19 minutes or until edges are deep golden brown. Cool in pan on cooling rack 5 minutes; remove from muffin cups. 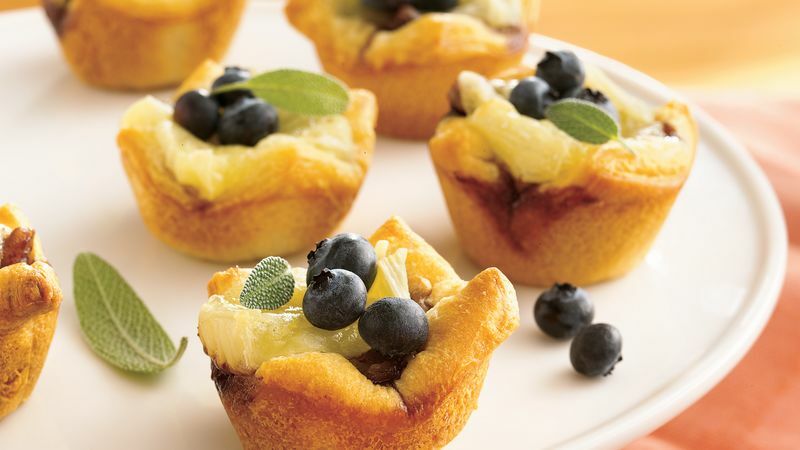 Garnish each with fresh blueberries. For best results, have your muffin cups and work surface ready, nuts toasted and cheese cut before removing dough from the refrigerator. Then, try to work quickly so that the dough stays cold. To toast walnuts, heat oven to 350°F. Bake uncovered in ungreased shallow pan 6 to 10 minutes, stirring occasionally, until golden brown.